Gardens… should be like lovely, well-shaped girls: all curves, secret corners, unexpected deviations, seductive surprises and then still more curves. I do like a hedge.Both tall and short ones. But, unlike H.E. Bates who liked his hedges curved like his women, ( remember he wrote the bucolic ‘Darling Buds of May’ where Pop Larkin kisses, caresses, and pinches most of the women that he encounters), I personally think they are usually best kept straight.Hedges I mean…….. In fact as I become more mature in my gardening years I find myself being increasingly drawn to a hedge.And where I used to put in a fence, trellis or low wall, I now plant a hedge. Why do you ask? They can make excellent smart evergreen boundaries, blocking unsightly views, and dividing driveways from the garden proper,especially if you choose the king of all hedging material- Taxus baccata to give it it’s Latin name ( or yew if you really must be common, my dears). But believe me, you can make a serious mistake if you plant the wrong sort of hedge. Confession coming up- when I first started gardening I planted a Leyland Cypress hedge in our first garden- aaaagh, yes, I really did! Within a few years it was taller than we could reach with ladders and completely shading out our tiny lawn. Lesson learned the hard way as we had to dig it out and start again. You needn’t stick to straight lines though, you could give in to your inner Pop Larkin and embrace the curves. My own hedge at the end of the garden is curvy. Or even go for topiary hedges, making a bird appear out of the green. Keeping your hedges clipped is very important to give a sharp line that contrasts nicely with your tumbling flower borders. I like to use a cordless Stihl hedgetrimmer as used by the National Trust.Cordless is great as I can dangerously wave it around in the air whilst hanging off a ladder without worrying about cutting through the power cable. 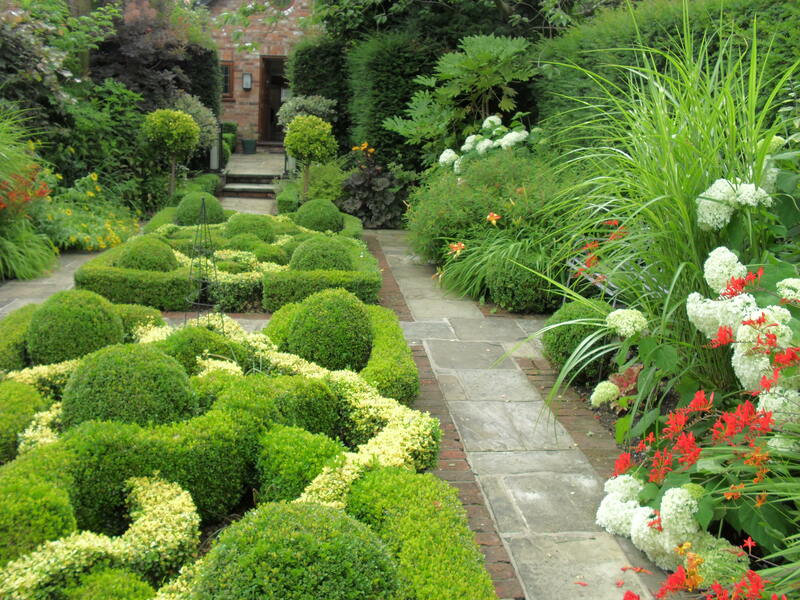 And if you really like clipping, why not try a knot garden? This is one I did using yellow and green box. And those tall yew hedges were put in at 6ft to give an instant screen. Yes, you can do a lot with a hedge. It looks like a fairyland!